Background: The prevalence of multidrug-resistant-tuberculosis (MDR-TB) among new and previously treated cases is increasing worldwide as well as in India. Rapid detection of MDR-TB allows the establishment of an effective treatment regimen; minimizes the risk of further resistance, and limits the spread of drug-resistant strains. Early diagnosis of MDR-TB is the need of the hour in high-TB burden countries like India, and GenotypeMTBDRplus is quite sensitive and specific in determining the molecular resistance in drugs such as rifampicin and isoniazid. 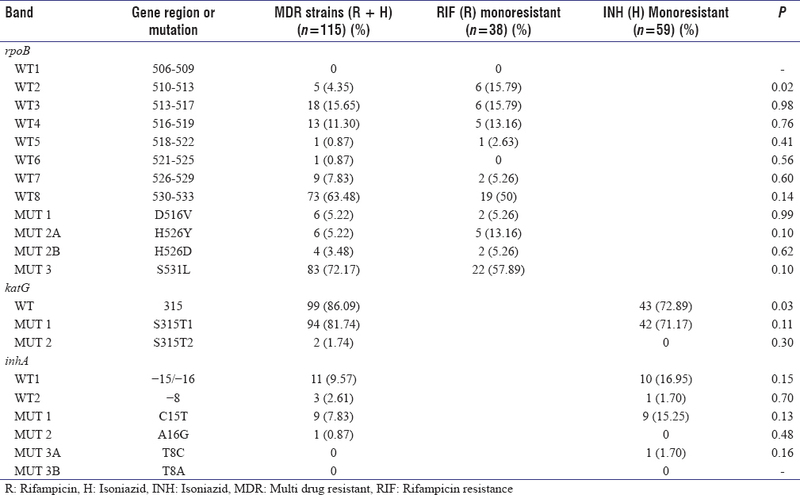 Methods: The present study was done for molecular detection of rifampicin and isoniazid resistance and resistance patterns among MDR-TB suspects and comparison of resistance patterns among new and previously treated cases by GenoType® MTBDRplus Line Probe Assay. A total of 1268 sputum samples of MDR-TB suspects were subjected to fluorescent microscopy. Fluorescent microscopy positive samples were subjected to GenoType® MTBDRplus (HAIN Lifescience) assay. Results: MDR-TB was detected 11.02%, 20.03% in new and previously treated cases. Among MDR-TB patients S531 L was the most common mutation detected in rpoB gene; 71.43% in new, and 72.17% in previously treated cases. S315T1 was the most common mutation noted in katG gene; 100% in new and 81.74% in previously treated. While in hA gene, it was C15T (7.8%) among previously treated cases. Conclusion: MDR-TB has high prevalence in the western part of Uttar Pradesh, India. Previously treated cases have even more high rate of MDR-TB than new TB cases. The most dominant gene mutations associated with resistance to INH and RIF were observed in codon 315 of the katG gene and codon 531 of the rpoB gene. While comparing the mutation patterns by Genotype MTBDRplus assay, previously treated cases showed more diversity of mutations and had greater number of unknown mutations. Among patients with multidrug-resistant tuberculosis (MDR-TB), delays in diagnosis and treatment initiation are frequently observed, resulting in an increased risk of disease complications, high mortality, and pretreatment lost to follow-up rates. In addition, such delays lead to an extended period of TB infectivity within the community, resulting in higher transmission rates, higher mortality, and morbidity. The prevalence of MDR-TB among new and previously treated cases is increasing worldwide as well as in India., Most of the burden of MDR-TB is mainly located in low- and middle-income countries. The transmission of drug-resistant tuberculosis strains is increasing because of the growing burden of MDR-TB patients., Rapid detection of MDR-TB allows the establishment of an effective treatment regimen; minimizes the risk of further resistance, and limits the spread of drug-resistant strains. Due to the slow growth of M. tuberculosis bacilli, delays in the detection of resistant strains can occur when conventional phenotypic assays are used. Nucleic acid amplification-based techniques are potentially the most rapid and sensitive methods for detection, identification, and susceptibility testing and are theoretically able to provide same day diagnosis from clinical samples.,,, These methods can potentially reduce the diagnostic time from weeks to days. The molecular basis of antitubercular drug resistance in M. tuberculosis is becoming clearer. More than 96% of rifampin-resistant strains have mutations in an 81-bp “core region” of the rpoB gene, which encodes the beta-subunit of the RNA polymerase, and the majority of isoniazid-resistant strains have been found to contain mutations in codon 315 of the katG gene, which encodes the catalase-peroxidase or mutations in the inhA ribosomal binding site. Line probe assay (LPA) genotype MTBDRplus assay is validated for both direct uses on smear-positive pulmonary specimens and on isolates of M. tuberculosis grown on liquid medium or in solid medium. Genotype MTBDRplus assay is based on multiplex polymerase chain reaction combined with reverse hybridization on nitrocellulose strips targeting common mutations for RIF and INH resistance. The assay has an additional advantage over other LPA because the Genotype MTBDRplus assay identifies mutations in the rpoB gene (coding for the β-subunit of the RNA polymerase) for the detection of RIF resistance, mutations in the katG gene (coding for the catalase-peroxidase) for high-level INH resistance, and mutations in the promoter region of inhA gene (coding for the NADH enoyl ACP reductase) for low-levels INH resistance. A 2008 meta-analysis found that the GenoTypeMTBDRplus assay and another similar commercial test had a pooled sensitivity of 98% for detecting RIF resistance and 89% for detecting INH resistance and specificity of 99% for R and H. In June 2008, the World Health Organization recommended the use of molecular LPA for the diagnosis of MDR-TB. Above statements bring to our concern that early diagnosis of MDR-TB is the need of the hour in high TB burden countries like India, and GenotypeMTBDRplus is quite sensitive and specific in determining the molecular resistance in drugs such as rifampicin and isoniazid. Knowing the profile of mutations and their occurrence in new and previously treated cases of MDR-TB in a respective geographical location may help in better understanding of molecular diagnosis of MDR-TB. Therefore, this study was aimed to determine MDR-TB prevalence in new and previously treated cases, and the patterns of mutations in rpoB gene (for detecting RIF resistance), katG and inhA gene (for detecting INH resistance) in MDR-TB suspected patients with the help of Genotype MTBDRplus Line Probe Assay. The study was approved by the Institutional Ethics and Research advisory committee, Faculty of Medicine, Aligarh Muslim University, Aligarh. The present study was conducted in Culture and DST Laboratory (RNTCP certified), Department of Microbiology on the sputum samples received of the MDR-TB suspected patients (according to PMDT guidelines) from the outpatient and in patients departments of the hospital and from various tuberculosis units in and around Aligarh region from January 2015 to August 2016. Sputum samples were collected as per RNTCP criteria (Central TB Division), which were subjected to fluorescent microscopy. The sputum specimens were handled in Class II biosafety cabinet and were decontaminated by N-acetyl-L-cysteine and sodium hydroxide (NALC-NaOH) method., Subsequently, the sediments were suspended in 1–1.5 ml sterile phosphate buffer (pH 6.8) and two bottles of Lowenstein–Jensen medium were inoculated with each sample. 500 μl of the processed sample was used for DNA isolation in a screw-capped tube. The GenoType MTBDRplus LPA was performed according to the manufacturer's (Hain Lifescience, Nehren, Germany) instructions. 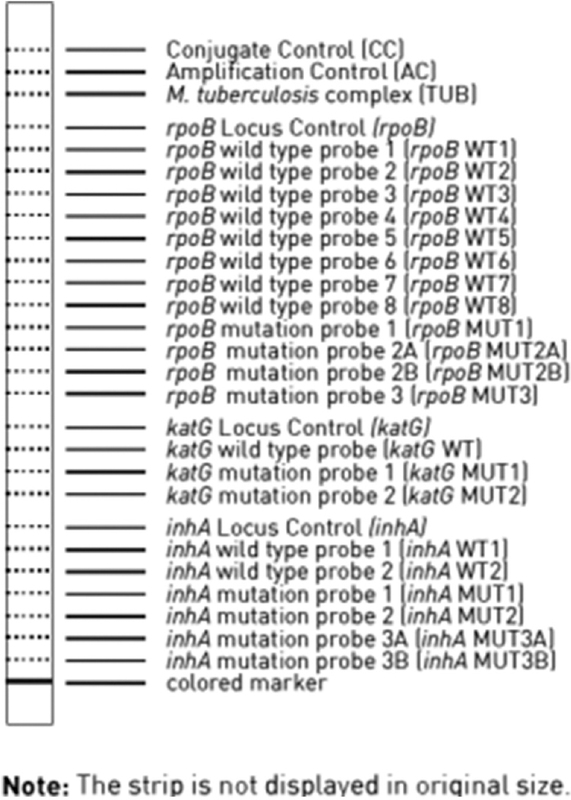 Each strip of LPA had 27 reaction zones (bands) including six controls (conjugate, amplification, M. tuberculosis complex band (TUB), rpoB, katG and inhA controls), eight rpoB wild-type (WT1–WT8) and four mutant probes (rpoB MUT D516V, rpoB MUT H526Y, rpoB MUT H526D, and rpoB MUT S531 L), one katG wild-type and two mutant probes (katG MUT S315T1 and katG MUT S315T2), and two inhA wild-type and four mutant probes (inhA MUT1 C15T, inhA MUT2 A16G, inhA MUT3A T8C, inhA MUT3B T8A) [Figure 1]. Either missing of wild-type band or the presence of mutant band was taken as an indication of a resistant strain. To give a valid result, all six expected control bands should appear correctly. Otherwise, the result is considered invalid. Data were analyzed using http://www.socscistatistics.com/tests/ztest/Default2.aspx. Descriptive data were presented as frequency (percentage). Z-score was used to calculate P value. P < 0.05 was considered statistically significant. A total of 1268 sputum samples of MDR-TB suspected cases from a period of 18 months from January 2015 to August 2016 were included in the study. The samples received were classified as new TB cases and previously treated cases as per Revised National TB Control Programme guidelines. Out of 1268 sputum samples from MDR-TB suspected patients, 194 (15.3%) were from new cases, and 1074 (84.7%) were from previously treated cases. All sputum samples were subjected to fluorescent microscopy of which 744 samples were positive. From the 744 fluorescent positive samples, 128 (17.2%) samples were from new cases, and 616 (82.8%) samples were from previously treated samples [Table 1]. All the 744 fluorescent positive samples were subjected to LPA. A total of 701 samples showed the presence of TUB band (M. tuberculosis complex) but was absent in 43 samples. Among the TUB band positive samples, 127 were new, and 574 were previously treated cases [Table 2]. Nearly 129 (18.40%) strains were found to be MDR that is, resistant to both drugs H as well as R and 459 (65.48%) were found sensitive for both drugs. However, monoresistance to isoniazid and rifampicin was detected in 69 (9.84%) and 44 (6.28%) strains, respectively, in both the cases [Table 3]. In new cases, of the 127 strains 14 (11.02%) strains were MDR (R + H resistant), and 97 (76.37%) strains were sensitive to both drugs (R + H). 6 (4.72%) and 10 (7.87%) were monoresistant to rifampicin and isoniazid [Table 3]. In previously treated cases, of 574 strains, 115 (20.03%) strains were found MDR (R + H resistant), and 362 (63.07%) strains were sensitive to both drugs (R + H). 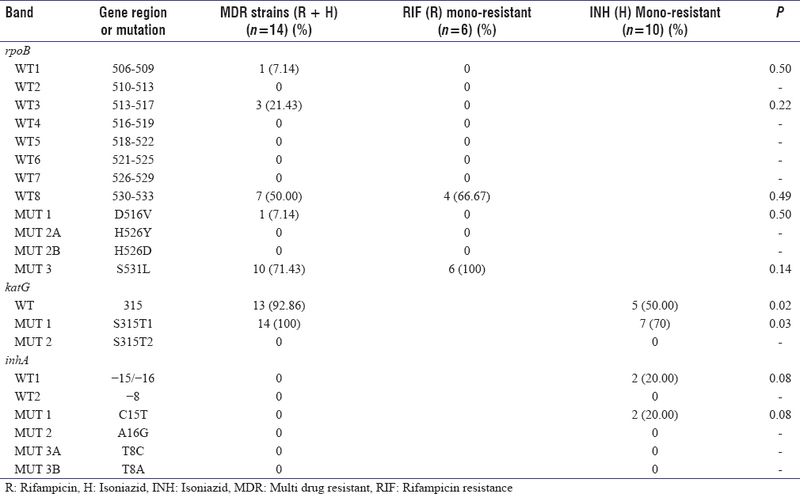 Monoresistance to rifampicin and isoniazid were 38 (6.62%) and 59 (10.28%) [Table 3]. An analysis of the frequency and mutational patterns associated with MDR-TB as well as monoresistant strains were performed using the GenoType® MTBDRplus assay. Readable bands pattern of rpoB, katG, and inhA section in GenoType® MTBDRplus assay results were obtained from the 701 MTBC strains. [Table 4] shows the pattern of gene mutations detected by Genotype MTBDRplus assay in drug-resistant mycobacterium strains. In rpoB gene, band patterns among the 14 MDR (R + H) maximum no. of strains 7 (50.00%) showed the absence of WT-8 band corresponding to mutation in the gene region 530–533. None of the strains showed absence of WT2, WT4, WT5, WT6, WT7 band corresponding to gene region 510–513, 516–519, 518–522, 521–525, and 526–529. MUT 3 band appeared in most of the strains 10 (71.43%) corresponding to S531 L mutation. Similarly among the 50 monoresistant R strain rpoB gene band patterns again WT-8 band was absent in most of the strains 4 (66.67%) corresponding to mutation in the gene region 530-533. None of the strains showed the absence of any other band. MUT 3 band appeared in all of the strains 6 (100%) corresponding to S531 L mutation. In the katG gene, among the 14 MDR strains absence of WT band was seen in 13 (92.86%) corresponding to gene region 315. Whereas the presence of MUT1 band was seen in 14 (100%) corresponding to the mutation in S315T1. Similarly among 10 monoresistant isoniazid strains absence of WT band was seen in 5 (50%) corresponding to gene region 315. Whereas the presence of MUT1 band was 7 (70%) corresponding to mutation in S315T1 and MUT2 band corresponding to S315T2 was not seen in any sample. In the inhA gene, among the 14 MDR strains, no gene mutations were detected. However, among 10 monoresistant isoniazid absence of WT1 band was seen in 2 (20%) corresponding to gene region -15/-16 whereas the presence of MUT 1 band was seen in 2 (20%) corresponding to mutation in C15T. S315T1 mutation in katG gene was more seen in MDR-TB strains (14/14) than monoresistant isoniazid strains (7/10) and was statistically significant with P value of 0.028. While the most common mutation (C15T) seen in inhA gene, among the new cases though seen more in monoresistant, INH strains were not statistically significant (P = 0.08). [Table 5] shows the pattern of gene mutations detected by Genotype MTBDRplus assay in drug-resistant mycobacterium strains among previously treated cases. In rpoB gene, band patterns among the 115 MDR (R + H) maximum number of strains 73 (63.48%) showed the absence of WT-8 band corresponding to mutation in the gene region 530-533. WT 2, WT 3, WT4, WT 5, WT 6, and WT 7 bands were absent in 5 (4.35%), 18 (15.65%), 13 (11.30%), 1 (0.87%), 1 (0.87%), 9 (7.83%) corresponding to mutation in the gene region 510–513, 513–517, 516–519, 518–522, 521–525, 526–529. None of the strains showed the absence of WT 1 band corresponding to gene region 506–509. MUT 3 band appeared in most of the strains 83 (72.17%) corresponding to S531 L mutation. Similarly, among the 38 monoresistant R strain rpoB gene band patterns again WT-8 band 19 (50%) was absent in most of the strains corresponding to mutation in the gene region 530–533. None of the strains showed the absence of WT 6 band 0 (0%) corresponding to gene region 521–525 and WT-1 (0%) corresponding to gene region 506–509. MUT 3 band appeared in most of the strains 22 (57.89%) corresponding to S531 L mutation. MUT 1, MUT 2A, and MUT 2B was seen in 2 (5.26%), 5 (13.16%), 2 (5.26%) strains corresponding to D516V, H526Y, and H526Y mutations. In the katG gene, among the 115 MDR strains, the absence of WT band was seen in 99 (86.09%) corresponding to gene region 315 whereas the presence of MUT1 and MUT2 band was seen in 94 (81.74%) and 2 (1.74%) corresponding to the mutation in S315T1 and S315T2. Similarly, among 59 monoresistant isoniazid, the absence of WT band was seen in 43 (72.89%) corresponding to gene region 315 whereas the presence of MUT1 band was 42 (71.17%) corresponding to mutation in S315T1. No strain showed the absence of MUT 2 band. In the inhA gene, among the 115 MDR strains, the absence of WT1 and WT2 band was seen in 11 (9.57%) and 3 (2.61%) corresponding to gene region-15/-16 and-8. Whereas the presence of MUT 1 band was seen in 9 (7.83%) corresponding to mutation in C15T and the presence of MUT 2 was seen in 1 (0.87%) corresponding to the mutation in A16G. Similarly, among 59 monoresistant isoniazid strains absence of WT1 and WT2 band was seen in 10 (16.95%) and 1 (1.70%) corresponding to gene region-15/-16 and-8. Whereas the presence of MUT 1 and MUT 3A bands was seen in 9 (15.25%) and 1 (1.70%) corresponding to mutation in C15T and T8C. Among the previously treated cases absence of WT 2 band corresponding to the mutation in region 510–513 of rpoB association with rifampicin monoresistant strains as compared to MDR-TB strains was statistically significant (P = 0.017). While the association of mutation in katg gene (315 region) with MDR-TB strains as compared to INH monoresistant strains was also statistically significant. (P = 0.03). [Table 6] shows the pattern of gene mutations detected by genotype MTBDRplus assay in drug-resistant mycobacterium strains. In rpoB gene, band patterns among the 129 MDR (R + H) maximum number of strains 80 (62.02%) showed the absence of WT 8 band corresponding to mutation in the gene region 530–533, next to it was absence of WT 3, WT 4, WT 7, WT 2 band in 21 (16.38%), 13 (10.08%), 9 (6.98%), and 5 (3.88%), respectively. The absence of WT 1, WT 5, WT 6 band were seen in 1 strain each only. MUT 3 band appeared in most of the strains 121 (67.22%) corresponding to S531 L mutation. Similarly among the 44 monoresistant R strain rpoB gene band patterns again WT 8 band was absent in most of the strains 23 (52.27%) corresponding to mutation in the gene region 530–533. None of the strains showed the absence of WT 1, WT 6 band corresponding to gene region 506–509 and 521–525. MUT 3 band appeared in most of the strains 28 (63.64%) corresponding to S531 L mutation. In the katG gene, among the 129 MDR strains absence of WT band was seen in 112 (86.82%) corresponding to gene region 315. Whereas the presence of MUT1 and MUT2 band was seen in 108 (83.72%) and 2 (1.55%) corresponding to mutation in S315T1 and S315T2. Similarly, among 69 monoresistant isoniazid strains the absence of WT band was seen in 48 (69.57%) corresponding to gene region 315. Whereas the presence of MUT1 band was 49 (71.01%) corresponding to mutation in S315T1. None of the strains shows the absence of MUT2 band. In the inhA gene, among the 129 MDR strains, the absence of WT1 and WT2 band was seen in 11 (8.53%) and 3 (2.33%) corresponding to gene region-15/-16 and-8. Whereas the presence of MUT 1 and MUT 2 band was seen in 9 (6.70%) and 01 (0.78%) corresponding to mutation in C15T and A16G. Similarly, among 69 monoresistant isoniazid absence of WT1 and WT2 band was seen in 12 (17.39%) and 1 (1.45%) corresponding to gene region-15/-16 and-8 whereas the presence of MUT 1 and MUT 3A bands was seen in 11 (15.94%) and 1 (1.45%) corresponding to mutation in C15T and T8C [Table 6]. As shown in [Table 7], among all the 173 rifampicin-resistant isolates detected by Genotype MTBDRplus assay due to mutation in rpoB gene, those samples that had absence of only one wild-type band or presence of one MUT band; S531 L mutation was the most common mutation seen in both new 16 (80.0%) and previously treated cases 100 (65.36%). H526Y was the second most common mutation detected in previously treated cases 7 (4.58%) while in new cases in was D516V 1 (5.00%). 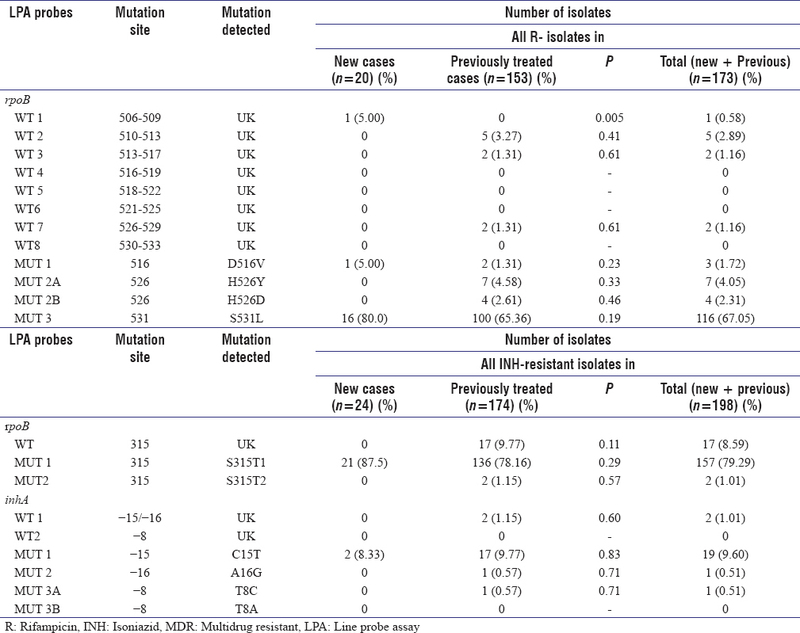 Similarly, in all the 198 isoniazid-resistant isolates detected by mutation in katG gene; S315T1 was the most common mutation detected in new 21 (87.5%), previously treated 136 (78.16%) as well as total cases 157 (79.29%). Isoniazid-resistant isolates detected by mutation in inhA gene C15T was the most common mutation detected in new 2 (8.33%), previously treated 17 (9.77%), and total cases 19 (9.60%) [Table 7]. [Table 8] shows among all the rifampicin-resistant strains detected by mutation in rpoB gene by Genotype MTBDR plus it was seen that most common absence of simultaneous WT 3, WT 4 was seen in new 2 (10%), previously treated 8 (5.23%), and 10 (5.78%) total cases. Corresponding mutations seen were the absence of WT 7 (region 526–529) and presence of MUT 2A band i.e., H526Y mutation in new 0 (0%), previously treated 2 (1.31%) and total cases 2 (1.16%). Similarly, WT 7, MUT 2B (H526D) were 0 (0%), 3 (1.96%), 3 (1.73%); WT8, MUT1, MUT2A (D516V, H526Y) were 0 (0%), 1 (0.65%), 1 (0.57%); WT8, MUT 2A (H526Y) were 0 (0%), 1 (0.65%), 1 (0.57%); WT8, MUT 3 (S531 L) were 11 (55%), 90 (58.82%), 101 (58.38%); WT3, WT4, MUT1 (D516V) were 1 (5%), 6 (3.92%), 7 (4.05%) in new, previously treated and total cases. 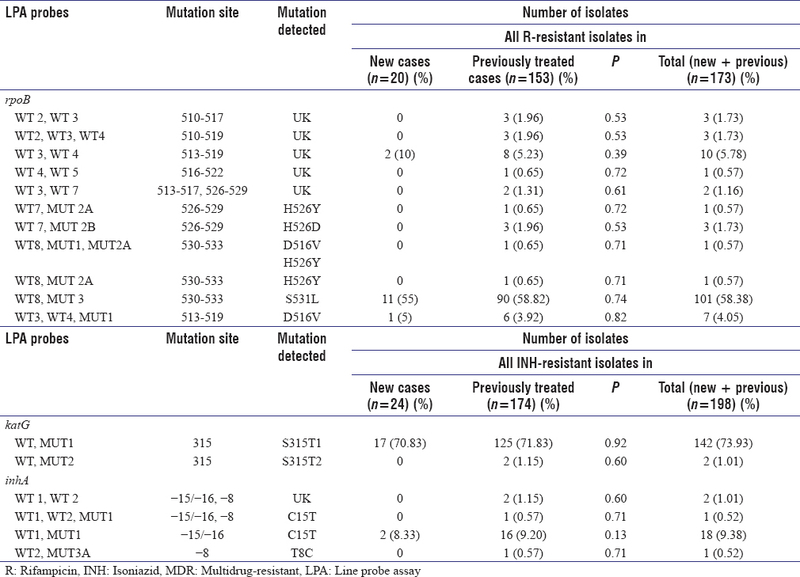 Among all isoniazid-resistant strains detected by mutation in katG gene mutations seen were absence of WT, presence of MUT 1 band, i.e., S315T1 mutation in 17 (70.83%) new, 125 (71.83%) previously treated, and 142 (73.93%) total cases. Similarly, the absence of WT with the presence of MUT 2, i.e., S315T2 in new 0 (0%), previously treated 2 (1.15%), and 2 (1.01%) total cases was seen. Isoniazid strains detected by mutation in inhA gene by absence of WT 1, WT 2 (-15/-16,-8) in 0 (0%) new, 2 (1.15%) previously treated, and 2 (1.01%) total cases. Corresponding mutation seen by the absence of WT1, WT2 (-15/-16,-8) presence of MUT1 (C15T) were 0 (0%), 1 (0.57%), 1 (0.52%); WT1, MUT1 (C15T) were 2 (8.33%), 16 (9.20%), 18 (9.38%); WT2, MUT3A (T8C) were 0 (0%), 1 (0.57%), 1 (0.52%) in new, previously treated and total cases. In the present study, 1268 sputum samples of MDR-TB suspected patients were subjected to microscopy. 194 (15.3%) were from new cases, and 1074 (84.7%) were from previously treated cases. Out of these, 744 light-emitting diode-fluorescent microscopy positive samples were tested by LPA. Genotype MTBDRplus LPA from Nehren Germany was used to get the result. A total of 701 samples showed the presence of TUB band (M. tuberculosis complex). It was absent in 43 samples. It was seen that most of the strains that were TUB band negative 42 (6.82%) belong to previously treated cases. These TUB band negative samples were found to be non-TB Mycobacterium on the basis of their growth characteristics, pigmentation, and by biochemical identification. Thakur et al. also reported 521 (90.76%) as MTBC positive and 53 (9.23%) as MTBC negative similar to our findings. Multidrug resistance can be conferred by a single mutational event the genes coding for multidrug efflux transporters, membrane proteins that recognize dissimilar toxic compounds and pump them out of eukaryotic and bacterial cells. Although efflux pump genes have been identified in mycobacteria, and M. tuberculosis, in particular, they do not seem to play a major role in the emergence of MDR strains.,,, To the contrary, multi-drug resistance is thought to be the consequence of stepwise accumulation of random mutations in the chromosome selected under the environmental pressure of chemotherapy. These findings have important implications for treatment program strategy., Drug resistance in M. tuberculosis occurs by random, single step, spontaneous mutation at a low but predictable frequency, in large bacterial populations. The probability of incidence of drug-resistant mutants is 10−8 for rifampicin, while for isoniazid and some of the other commonly used drugs it is 10−6. Therefore, the probability for resistance to both isoniazid and rifampicin to develop is 10−14, which is much larger than the number of organisms present in a medium-sized cavity in a patient with open pulmonary TB. In our study, 129 (18.40%) strains were found to be MDR that is, resistant to both drugs isoniazid as well as rifampicin. Monoresistance to isoniazid and rifampicin were detected in 69 (9.84%) and 44 (6.28%) strains, respectively. Other studies from across India depicted MDR, monoresistant RIF and monoresistant INH as 29.41%, 2.94% and 8.82%; 42%, 11%, and 10%, 55.5%, 14.8%, and 9.2%; 19.76%, 6.14, and 8.63; 28%, 1%, and 10%, respectively. Maurya et al. reported 13.4% MDR-TB in extrapulmonary tuberculosis cases. MDR-TB suspected patients were divided into new cases and previously treated cases. Resistance to both rifampicin and isoniazid were seen in 14 (11.02%) new cases. Whereas in previously treated cases, it was 115 (20.03%). Monoresistance to rifampicin and isoniazid in new cases were seen in 6 (4.72%) and 10 (7.87%) patients. Similarly, monoresistance to rifampicin and isoniazid in previously treated cases were seen in 38 (6.62%) and 59 (10.28%). Primary drug resistance to isoniazid in the present study was found to be 18.89% which was quite similar to other reported studies in India such as New Delhi 18.5% Jabalpur 17%, Raichur 18.7%, higher than Tamil Nadu 15.4%, Wardha 15%, Jaipur 13.6%, and Ranchi 2.86%; lower than Himachal Pradesh that showed 21.35% resistance in newly diagnosed cases. However, primary drug resistance to isoniazid in other countries was reported from Uganda 5.8%, Germany 7.1%, and Australia 8.9%. In other studies, higher resistance was reported from Bangladesh with 54.5% and Saudi Arabia with 33.8%. On the other hand, primary drug resistance to rifampicin in the present study was observed to be 15.74% which is lower to the study done by Thakur et al. 2015 that showed 19.42% resistance but was higher as compared to other studies in India; New Delhi 0.6%, Wardha 0.5%, Jabalpur 2% and Raichur 2.5%, Bengaluru 2.6%, Ranchi 3.51%, Tamil Nadu 4.4%, Lucknow 4.7%, and Jaipur 6.8%. Internationally, resistance to rifampicin was reported from China 6.6%, Uganda 1.5%, Germany 1.6%, and Australia 2.6%. Higher resistance was reported from Saudi Arabia 23.5% and Bangladesh 50%. Overall MDR-TB cases gradually decreased from 2009 to 2015 in both new and previously treated cases in Northern India, but still the prevalence rate is higher in North India than National Prevalence rate of MDR-TB. The rate of primary MDR-TB in our study was 11.02% that was slightly lower to that reported from Himachal 12.62% that is comparatively higher to several reports elsewhere in India, Lucknow 4.7% and Jaipur 4.5%. A study from Mumbai revealed the highest proportion of MDR-TB in new cases with 24%. MDR-TB rate was also reported from other countries such as China 5.7%, Bangladesh 40.9%, Saudi Arabia 20.6%, and Philippines 2%. In our study, higher rate of primary drug resistance was observed as compared to other studies in India, as patients included in this study were exclusively MDR-TB suspects. Acquired drug resistance to isoniazid in the present study was found to be 30.31%, which was similar to that in Himachal Pradesh with 30.14%, lower than Mumbai with 53.2%, Jaipur 39.7% from Indian studies. This is also lower than Ethiopia with 56.1%, Bangladesh 82.6%, and China 38.8%, but higher than Germany where it is 15.4%, Sri Lanka 5.3%, and Uganda 20% in addition to the very similar rate of resistance reported from Australia 29.2% from the studies of other countries. Similarly, acquired drug resistance to rifampicin in the present study was 26.65%, a very similar finding reported from Jaipur 28.2% and Himachal Pradesh 27.51%. Higher rates of resistance were reported by other studies in India from Mumbai with 74.4% and New Delhi 33.7%. It is also higher in other countries such as Ethiopia with 46.1%, China 29.7%, Uzbekistan 62.5% and Bangladesh 80%; however, lower rate of resistance reported from Uganda with 13.4%, Germany 7.7%, and Sri Lanka 2.6%. Acquired MDR-TB in the present study was 20.03%. Similar resistance was reported from Jaipur 24.3% and Himachal Pradesh with 21.53% but higher than Bengaluru 12.8%. Comparatively higher resistance was reported at New Delhi with 33.7% and Mumbai 41%. Studies from Philippines and Nigeria reported 21% and 3.1%. Collectively, DNA sequencing studies demonstrate that more than 95% of RIF-resistant M. tuberculosis strains have a mutation within the 81-bp hotspot region of the rpoB gene.,, An analysis of the frequency and mutational patterns associated with MDR-TB as well as monoresistant strains were performed using the GenoType® MTBDRplus assay. Readable bands pattern of rpoB, katG, and inhA section in GenoType® MTBDRplus assay results were obtained from the 701 MTBC strains (127 from new cases and 574 from previously treated cases). Among the 173 rifampicin resistant and 198 isoniazid-resistant strains, 147 (83.04%), 159 (80.30%), and 22 (11.11%) strains harbored known mutation in rpoB, katG, and inhA genes, respectively. Similar studies from India and other countries having high prevalence of TB reported mutations in rpoB, katG, and inhA as 74.8%, 76.35, and 5.40%; 83.10, 86.20, and 18.39; 83.10, 86.20, and 18.39; 80%, 93.33%, and 28.9%; 70.70, 89.55, and 13.90%; 78.94%, 76.47%, and 17.64%; 85.3%, 90.2%, and 9.8%; 57.89%, 76.19, and 19.05, respectively. Van Rie et al. reported in 2001 that rifampicin resistance was highly associated with mutation in the 81 base pair region of the rpoB gene. Rifampicin resistance is known to be associated with mutations in 81 base pair region (codon 527–533) of the rpoB gene.,, In this study, we also found that the most common mutation is associated with rpoB 530-533 region, mostly S531 L mutation (69.94%). This mutation was more frequently found in MDR-TB strains (72.10%) than in rifampicin monoresistant strains (63.64%); however, it was not statistically significant (P = 0.29). Similar findings were reported in Himachal Pradesh by Thakur et al. which showed 62.2% mutation in S531 L region among all rifampicin resistance and 64.07% among MDR and 56.25% among rifampicin monoresistant. Other studies conducted in India; from Karnataka (72.22%), New Delhi (59.76%), Uttar Pradesh (62.3%), New Delhi (47%), and New Delhi (72%) also showed similar results. Outside India, it was seen that similar results were detected by Albert et al. in Uganda (47.61%), Hillemann et al. 2007 from Germany (73.6%), Sharma et al. from Nepal (50%), and Cavusoglu et al. 2006 from Turkey (56.1%). Most of the above-mentioned studies also showed that there was no significant difference in the prevalence of this S531 L mutation in MDR-TB specimen and rifampicin monoresistance specimen. Other mutations were detected in the rpoB codon such as D516V (5.20%), H526Y (6.36%) and H526D (3.47%). Thakur et al. detected in the rpoB codon, such as D516V (4.44%), H526Y (5.18%) and H526D (2.96%) which were quite similar to our results. 506-509, 521-525 region in the rpoB gene showed only one mutation in the 173 rifampicin-resistant samples in our study. Raizada et al. showed 3.75% mutation in this region. In both new and previously treated cases, S531 L mutation was the most common mutation detected. However, it was higher in new 16 (80%) than in previously treated 105 (68.63%). However, it was not statistically significant (P = 0.30). 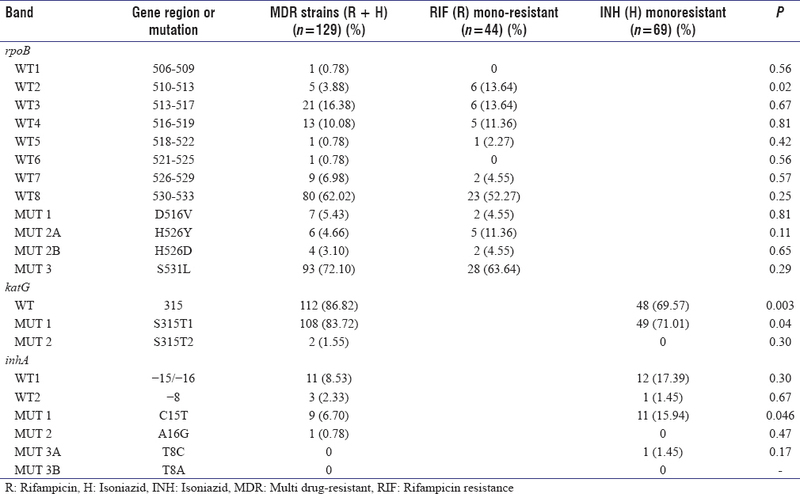 The most frequent mutation found in INH-resistant strains was katG mutations 181/198 (91.41%) which occurred more commonly in MDR-TB strains (118/129 [91.47%]) compared to INH monoresistant strains (56/69 [81.16%]). Overall the frequency of inhA mutation was 26/198 (13.13%) and was lower in MDR-TB strains (11/129 [8.53%]) as compared to INH monoresistant strains (14/69 [20.29%]). Both the findings were statistically significant P value for the former and latter being 0.03and 0.02, respectively. Very similar findings were reported from AIIMS New Delhi and Karnataka. Isoniazid resistance was most commonly associated with katG S315T1 mutation, in many high-TB burden countries, presumably related to ongoing transmission of these strains., In the present investigation, 80.81% mutation in the codon S315T1 that led amino acid serine substitution to threonine among the all INH-resistant strains, it was 83.72% in MDR strains and 71.01% in INH monoresistant strains. S315T2 mutation was less common 2 (1.55%). In this study, the confirmed mutation in inhA gene was found (10.10%) in the promoter region that led amino acid substitution of cysteine to threonine C15T region and 1 (1.45%) in T8C region. These findings of the present study are within the range of various studies conducted all over India like Thakur et al. showed that 74.32% mutation in the codon S315T1 (katG) and 5.40% % in the C15T (inhA) region, Yadav et al. S315T1 (83.91%), C15T (17.24%), Singhal et al. reported INH-resistant isolates, 73/86 (84.88%) of which 11 (12.79%) had mutation in codon C15T and 1 (1.16%) in T8C. Maurya et al. also showed that the most prominent mutations in katG and inhA genes were in S315T1 (93.3%) and 8 in C15T (17.7%). Raizada et al. reported S531T1 (71.33%) and C15T (7.64%). Ranganath et al. also showed S315T1 in 84.46%, and 14.70% in C15T and 2.94% in T8C. From worldwide, Tadesse M et al., Albert and et al. 2010, Tukvadze et al., Barnard et al., and Kiepiela et al. also reported similar findings. Among various mutations observed using Genotype MTBDR plus assay, majority of the drug-resistant isolates had multiple mutations (21/173 i.e., 12.13% for RIF resistance, 3/198 i.e., 1.52% for INH resistance) in our study. Multiple mutations were more common in previously treated cases (12.41%) than new cases (10%) in all rifampicin-resistant isolates. These multiple mutations are believed to be more probable in high-TB incidence places. However, the P value came out to be 0.75 which was not statistically significant. Although most common single mutation in rpoB gene among new and previously treated cases was S531 L, it was higher in the former (80%) than in the latter (65.36%). Previously treated cases had strains having other mutations such as H526Y (4.45%) and H526D (2.61%) which were not seen in new cases strains. Similarly, in katG gene, most common mutation was S315T1 among new (87.5%) and previously treated (78.16%) cases. S315T2 mutation was seen only in previously treated cases. Previously treated cases showed more diversity in mutations in all three genes. Like in rpoB gene absence of WT2, WT3, and WT7, bands were seen in previously treated cases but no corresponding MUT band was present implying that mutations would have occurred other than the common mutations (D516V, H526Y, H526D, and S531 L) which are detected by GenoptypeMTBDRplus assay. From these observations, we can comment that MDR-TB has high prevalence in the western part of Uttar Pradesh, India. Previously treated cases have even more high rate of MDR-TB than new TB cases. The most dominant gene mutations associated with resistance to INH and RIF were observed in codon 315 of the katG gene and codon 531 of the rpoB gene. While comparing the mutation patterns by Genotype MTBDRplus assay, previously treated cases showed more diversity of mutations and had a greater number of unknown mutations that are not included in the strips. Phenotypic and genotypic approaches are therefore complimentary for obtaining high sensitivity and specificity in detecting drug resistance and susceptibilities to accurately predict MDR-TB cure and to gather the relevant data for resistance surveillance. More pooled data is required from across India to provide a standardized and comprehensive approach for the interpretation of mutations as predictors of MDR-TB drug-resistant phenotype. The authors would like to thank the technical members of culture, DST, and LPA laboratory, Department of Microbiology, Jawaharlal Nehru medical college, Aligarh Muslim University, Aligarh, Uttar Pradesh, for their technical support during research work. Orenstein EW, Basu S, Shah NS, Andrews JR, Friedland GH, Moll AP, et al. Treatment outcomes among patients with multidrug-resistant tuberculosis: Systematic review and meta-analysis. Lancet Infect Dis 2009;9:153-61. World Health Organization. Molecular Line Probe Assays for Rapid Screening of Patients at Risk of Multi-Drug Resistant Tuberculosis (MDR-TB). Policy Statement. Geneva: TBC India; 2008. Available from: http://www.who.int/tb/features_archive/policy_statement.pdf. [Last accessed on 2015 Jul 15]. Sharma BK, Bhandari S, Maharjan B, Shrestha B, Banjara MR. Rapid detection of rifampicin and isoniazid resistant Mycobacterium tuberculosis using genotype MTBDRplus assay in Nepal. Int Sch Res Notices 2014;2014:648294. Gillespie SH. Evolution of drug resistance in Mycobacterium tuberculosis: Clinical and molecular perspective. Antimicrob Agents Chemother 2002;46:267-74. Hillemann D, Weizenegger M, Kubica T, Richter E, Niemann S. Use of the genotype MTBDR assay for rapid detection of rifampin and isoniazid resistance in Mycobacterium tuberculosis complex isolates. J Clin Microbiol 2005;43:3699-703. Hillemann D, Rüsch-Gerdes S, Richter E. Evaluation of the GenoType MTBDRplus assay for rifampin and isoniazid susceptibility testing of Mycobacterium tuberculosis strains and clinical specimens. J Clin Microbiol 2007;45:2635-40. Falzon D, Jaramillo E, Schünemann HJ, Arentz M, Bauer M, Bayona J, et al. WHO guidelines for the programmatic management of drug-resistant tuberculosis: 2011 update. Eur Respir J 2011;38:516-28. Sharma SK, Kumar S, Saha PK, George N, Arora SK, Gupta D, et al. Prevalence of multidrug-resistant tuberculosis among category II pulmonary tuberculosis patients. Indian J Med Res 2011;133:312-5. Sotgiu G, Centis R, D'Ambrosio L, Tadolini M, Castiglia P, Migliori GB, et al. Do we need a new Fleming époque: The nightmare of drug-resistant tuberculosis. Int J Mycobacteriol 2013;2:123-5. Kant S, Maurya AK, Kushwaha RA, Nag VL, Prasad R. Multi-drug resistant tuberculosis: An iatrogenic problem. Biosci Trends 2010;4:48-55. Vijdea R, Stegger M, Sosnovskaja A, Andersen AB, Thomsen VØ, Bang D, et al. Multidrug-resistant tuberculosis: Rapid detection of resistance to rifampin and high or low levels of isoniazid in clinical specimens and isolates. Eur J Clin Microbiol Infect Dis 2008;27:1079-86. Kapur V, Li LL, Iordanescu S, Hamrick MR, Wanger A, Kreiswirth BN, et al. Characterization by automated DNA sequencing of mutations in the gene (rpoB) encoding the RNA polymerase beta subunit in rifampin-resistant Mycobacterium tuberculosis strains from new york city and texas. J Clin Microbiol 1994;32:1095-8. Patnaik M, Liegmann K, Peter JB. Rapid detection of smear-negative Mycobacterium tuberculosis by PCR and sequencing for rifampin resistance with DNA extracted directly from slides. J Clin Microbiol 2001;39:51-2. Rinder H, Mieskes KT, Tortoli E, Richter E, Casal M, Vaquero M, et al. Detection of embB codon 306 mutations in ethambutol resistant Mycobacterium tuberculosis directly from sputum samples: A low-cost, rapid approach. Mol Cell Probes 2001;15:37-42. Miller N, Cleary T, Kraus G, Young AK, Spruill G, Hnatyszyn HJ, et al. Rapid and specific detection of Mycobacterium tuberculosis from acid-fast bacillus smear-positive respiratory specimens and BacT/ALERT MP culture bottles by using fluorogenic probes and real-time PCR. J Clin Microbiol 2002;40:4143-7. Telenti A, Imboden P, Marchesi F, Lowrie D, Cole S, Colston MJ, et al. Detection of rifampicin-resistance mutations in Mycobacterium tuberculosis. Lancet 1993;341:647-50. Zhang Y, Heym B, Allen B, Young D, Cole S. The catalase-peroxidase gene and isoniazid resistance of Mycobacterium tuberculosis. Nature 1992;358:591-3. Banerjee A, Dubnau E, Quemard A, Balasubramanian V, Um KS, Wilson T, et al. InhA, a gene encoding a target for isoniazid and ethionamide in Mycobacterium tuberculosis. Science 1994;263:227-30. Ling DI, Zwerling AA, Pai M. GenoType MTBDR assays for the diagnosis of multidrug-resistant tuberculosis: A meta-analysis. Eur Respir J 2008;32:1165-74. Buyankhishig B, Oyuntuya T, Tserelmaa B, Sarantuya J, Lucero MG, Mitarai S, et al. Rapid molecular testing for multi-resistant tuberculosis in mongolia: A diagnostic accuracy study. Int J Mycobacteriol 2012;1:40-4. Yadav RN, Singh BK, Sharma SK, Sharma R, Soneja M, Sreenivas V, et al. Comparative evaluation of GenoType MTBDRplus line probe assay with solid culture method in early diagnosis of multidrug resistant tuberculosis (MDR-TB) at a tertiary care centre in India. PLoS One 2013;8:e72036. Thakur C, Kumar V, Gupta AK. Detecting mutation pattern of drug-resistant Mycobacterium tuberculosis isolates in Himachal Pradesh using GenoType(®) MTBDRplus assay. Indian J Med Microbiol 2015;33:547-53. Aínsa JA, Blokpoel MC, Otal I, Young DB, De Smet KA, Martín C, et al. Molecular cloning and characterization of tap, a putative multidrug efflux pump present in Mycobacterium fortuitum and Mycobacterium tuberculosis. J Bacteriol 1998;180:5836-43. De Rossi E, Branzoni M, Cantoni R, Milano A, Riccardi G, Ciferri O, et al. Mmr, a Mycobacterium tuberculosis gene conferring resistance to small cationic dyes and inhibitors. J Bacteriol 1998;180:6068-71. Sander P, De Rossi E, Böddinghaus B, Cantoni R, Branzoni M, Böttger EC, et al. Contribution of the multidrug efflux pump lfrA to innate mycobacterial drug resistance. FEMS Microbiol Lett 2000;193:19-23. Saltini C. Chemotherapy and diagnosis of tuberculosis. Respir Med 2006;100:2085-97. Heym B, Honoré N, Truffot-Pernot C, Banerjee A, Schurra C, Jacobs WR Jr., et al. Implications of multidrug resistance for the future of short-course chemotherapy of tuberculosis: A molecular study. Lancet 1994;344:293-8. Raveendran R, Wattal C, Oberoi JK, Goel N, Datta S, Prasad KJ, et al. Utility of genoType MTBDRplus assay in rapid diagnosis of multidrug resistant tuberculosis at a tertiary care centre in India. Indian J Med Microbiol 2012;30:58-63. Raizada N, Sachdeva KS, Chauhan DS, Malhotra B, Reddy K, Dave PV, et al. Amulti-site validation in India of the line probe assay for the rapid diagnosis of multi-drug resistant tuberculosis directly from sputum specimens. PLoS One 2014;9:e88626. Jain NK, Chopra KK, Prasad G. Initial and acquired INH and rifampicin resistant to Mycobacterium tuberculosis and its implication for treatment. Indian J Tuberc 1992;39:180-6. Paramasivan CN, Venkataraman P, Chandrasekaran V, Bhat S, Narayanan PR. Surveillance of drug resistance in tuberculosis in two districts of South India. Int J Tuberc Lung Dis 2002;6:479-84. Paramasivan CN, Bhaskaran K, Venkataraman P, Chandrasekaran V, Narayanan PR. Surveillance of drug resistance in tuberculosis in the state of Tamil Nadu. Indian J Tuberc 2000;47:27-33. Malhotra B, Dashora D, Kumar V, Goyal S, Sharma B, Kumar M, et al. Genetic diversity and drug sensitivity profiles of Mycobacterium tuberculosis isolates from two slums of Jaipur city, Rajasthan, India. Indian J Med Res 2017;145:74-83. Rai SP, Bhattacharyya D, Kashyap M. Pattern of initial drug resistance and its impact on short course chemotherapy of pulmonary tuberculosis. Lung India 2007;24:51-3. World Health Organisation. Global Tuberculosis Report 2011. Available from: http://www.apps.who.int/iris/bitstream/10665/ 4728/1/ 9789241564380_eng.pdf?ua=1. [Last accessed on 2013 Jan 21]. Banu S, Mahmud AM, Rahman MT, Hossain A, Uddin MK, Ahmed T, et al. Multidrug-resistant tuberculosis in admitted patients at a tertiary referral hospital of Bangladesh. PLoS One 2012;7:e40545. Asaad AM, Alqahtani JM. Primary anti-tuberculous drugs resistance of pulmonary tuberculosis in Southwestern Saudi Arabia. J Infect Public Health 2012;5:281-5. Mahadev B, Jagota P, Srikantaramu N, Gnaneshwaran M. Surveillance of drug resistance in Mysore district, Karnataka. NTI Bull 2003;39:5-10. Gupta H, Kant S, Jain A, Natu SM, Ahluwalia S. Initial drug resistance pattern among pulmonary tuberculosis patients. Indian J Tuberc 2013;60:154-61. Kumar A, Singh AK, Upadhyay V, Pandey J. Epidemiology of multi-drug-resistant tuberculosis in Northern India. Biomed Biotechnol Res J 2018;2:112-21. D'souza DT, Mistry NF, Vira TS, Dholakia Y, Hoffner S, Pasvol G, et al. High levels of multidrug resistant tuberculosis in new and treatment-failure patients from the revised national tuberculosis control programme in an urban metropolis (Mumbai) in Western India. BMC Public Health 2009;9:211. Solante MB, Chagan-Yasutan H, Hattori T, Leano S, Garfin AG, Soolingen DV, et al. High rates of human immunodeficiency virus and drug resistance in tuberculosis patients in Manila, Philippines. Biomed Biotechnol Res J 2017;1:157-62. Menon S, Dharmshale S, Chande C, Gohil A, Lilani S, Mohammad S, et al. Drug resistance profiles of Mycobacterium tuberculosis isolates to first line anti-tuberculous drugs: A five years study. Lung India 2012;29:227-31. Abate D, Taye B, Abseno M, Biadgilign S. Epidemiology of anti-tuberculosis drug resistance patterns and trends in tuberculosis referral hospital in Addis Ababa, Ethiopia. BMC Res Notes 2012;5:462. Ulmasova DJ, Uzakova G, Tillyashayhov MN, Turaev L, van Gemert W, Hoffmann H, et al. Multidrug-resistant tuberculosis in Uzbekistan: Results of a nationwide survey, 2010 to 2011. Euro Surveill 2013;18. pii: 20609. Vijay S, Balasangameshwara VH, Jagannatha PS, Saroja VN, Shivashankar B, Jagota P. Retreatment outcome of smear positive tuberculosis cases under DOTS in Bangalore city. Indian J Tuberc 2002;49:195-204. Mohammad AB, Iliyasu G, Habib AG. Prevalence and genetic determinant of drug-resistant tuberculosis among patients completing intensive phase of treatment in a tertiary referral center in Nigeria. Int J Mycobacteriol 2017;6:47-51. Mani C, Selvakumar N, Narayanan S, Narayanan PR. Mutations in the rpoB gene of multidrug-resistant Mycobacterium tuberculosis clinical isolates from India. J Clin Microbiol 2001;39:2987-90. Cavusoglu C, Hilmioglu S, Guneri S, Bilgic A. Characterization of RpoB mutations in rifampin-resistant clinical isolates of Mycobacterium tuberculosis from Turkey by DNA sequencing and line probe assay. J Clin Microbiol 2002;40:4435-8. Maurya AK, Singh AK, Kant S, Umrao J, Kumar M, Kushwaha RA, et al. Use of genoType® MTBDRplus assay to assess drug resistance and mutation patterns of multidrug-resistant tuberculosis isolates in Northern India. Indian J Med Microbiol 2013;31:230-6. Singhal R, Arora J, Lal P, Balla M, Myneeedu VP, Vehera D. Detection of multi-drug resistant tuberculosis by line probe assay. Indian J Med Res 2012;136:1044-7. Ranganath R, Vijay Kumar GS, Javali V, Ranganath R. Line probe assay as a rapid tool for detection of MDRTB. Ann Res Rev Biol 2014;4:246-57. Tadesse M, Aragaw D, Dimah B, Efa F, Abdella K, Kebede W, et al. Drug resistance-conferring mutations in Mycobacterium tuberculosis from pulmonary tuberculosis patients in Southwest Ethiopia. Int J Mycobacteriol 2016;5:185-91. Van Rie A, Warren R, Mshanga I, Jordaan AM, van der Spuy GD, Richardson M, et al. Analysis for a limited number of gene codons can predict drug resistance of Mycobacterium tuberculosis in a high-incidence community. J Clin Microbiol 2001;39:636-41. Yue J, Shi W, Xie J, Li Y, Zeng E, Wang H, et al. Mutations in the rpoB gene of multidrug-resistant Mycobacterium tuberculosis isolates from China. J Clin Microbiol 2003;41:2209-12. Ramaswamy S, Musser JM. Molecular genetic basis of antimicrobial agent resistance in Mycobacterium tuberculosis: 1998 update. Tuber Lung Dis 1998;79:3-29. Somoskovi A, Parsons LM, Salfinger M. The molecular basis of resistance to isoniazid, rifampin, and pyrazinamide in Mycobacterium tuberculosis. Respir Res 2001;2:164-8. Baker LV, Brown TJ, Maxwell O, Gibson AL, Fang Z, Yates MD, et al. Molecular analysis of isoniazid-resistant Mycobacterium tuberculosis isolates from England and Wales reveals the phylogenetic significance of the ahpC -46A polymorphism. Antimicrob Agents Chemother 2005;49:1455-64. Barnard M, Albert H, Coetzee G, O'Brien R, Bosman ME. Rapid molecular screening for multidrug-resistant tuberculosis in a high-volume public health laboratory in South Africa. Am J Respir Crit Care Med 2008;177:787-92. Miotto P, Piana F, Cirillo DM, Migliori GB. Genotype MTBDRplus: A further step toward rapid identification of drug-resistant Mycobacterium tuberculosis. J Clin Microbiol 2008;46:393-4. Zhang Y, Telenti A. Genetics of drug resistance in Mycobacterium tuberculosis. In: Hatfull GF, Jacobs WR, editors. Molecular Genetics Mycobacteria. Washington, DC: American Society for Microbiology Press; 2000. p. 235-56. Mokrousov I, Narvskaya O, Otten T, Limeschenko E, Steklova L, Vyshnevskiy B, et al. High prevalence of KatG Ser315Thr substitution among isoniazid-resistant Mycobacterium tuberculosis clinical isolates from Northwestern Russia, 1996 to 2001. Antimicrob Agents Chemother 2002;46:1417-24. Kim SY, Park YJ, Kim WI, Lee SH, Ludgerus Chang C, Kang SJ, et al. Molecular analysis of isoniazid resistance in Mycobacterium tuberculosis isolates recovered from South Korea. Diagn Microbiol Infect Dis 2003;47:497-502. Nikolayevsky V, Brown T, Balabanova Y, Ruddy M, Fedorin I, Drobniewski F, et al. Detection of mutations associated with isoniazid and rifampin resistance in Mycobacterium tuberculosis isolates from samara region, Russian federation. J Clin Microbiol 2004;42:4498-502. Zhang M, Yue J, Yang YP, Zhang HM, Lei JQ, Jin RL, et al. Detection of mutations associated with isoniazid resistance in Mycobacterium tuberculosis isolates from China. J Clin Microbiol 2005;43:5477-82. Tukvadze N, Kempker RR, Kalandadze I, Kurbatova E, Leonard MK, Apsindzelashvili R, et al. Use of a molecular diagnostic test in AFB smear positive tuberculosis suspects greatly reduces time to detection of multidrug resistant tuberculosis. PLoS One 2012;7:e31563. Kiepiela P, Bishop KS, Smith AN, Roux L, York DF. Genomic mutations in the KatG, InhA and AphC genes are useful for the prediction of isoniazid resistance in Mycobacterium tuberculosis isolates from Kwazulu Natal, South Africa. Tuber Lung Dis 2000;80:47-56. Ahmed S, Shukla I, Fatima N, Varshney SK, Shameem M. Evaluation of genotype MTBDRplus line probe assay in detection of rifampicin and isoniazid resistance in comparison to solid culture drug susceptibility testing in a tertiary care centre of Western Uttar Pradesh. Indian J Med Microbiol 2017;35:568-74. Ramaswamy SV, Reich R, Dou SJ, Jasperse L, Pan X, Wanger A, et al. Single nucleotide polymorphisms in genes associated with isoniazid resistance in Mycobacterium tuberculosis. Antimicrob Agents Chemother 2003;47:1241-50.